My pup Roscoe is a sneak and a thief. No matter the temptation, it proves to be too strong. We’re working on some discipline to HELP him make wiser choices, but in the meantime, he’s a real scamp. I’ve had to take the toilet paper off the roller recently and place the paper up on the bathroom cabinet… or simply shut the door. The fluffy roll of TP is just too tempting. He grabs the end of the roll and races through the house and out the doggy door into the back yard. 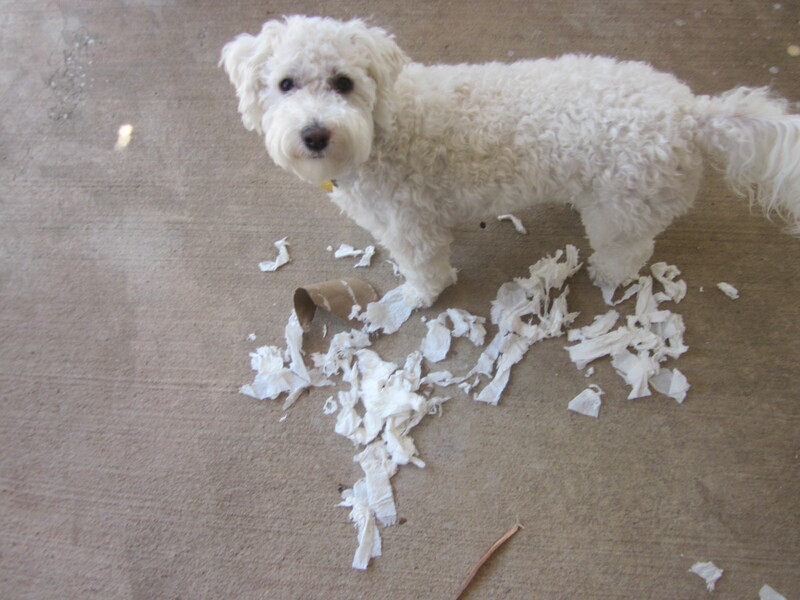 One day, he grabbed a fresh roll and I found it all over the cement sidewalk on our side yard ~ including the cardboard roll. He had a totally self-satisfied look on his face. But it’s not just toilet paper. If I don’t place a washcloth on the towel bar when I’m done at the sink or in the tub, Roscoe snatches the washcloth and runs for the bed. He rolls over and over, “enjoying” his soggy prize until our bed is soaked! BAD dog! Such a sneaky little thief. He’s not getting away with anything, of course. His master, “Mama,” always knows. He can’t hide the evidence for long. I’m a little like Roscoe sometimes. I know good and well that my Master sees and knows what I do. Everything is open to His eyes. The Bible says, “Nothing in all creation is hidden from God’s sight. Everything is uncovered and laid bare before the eyes of him to whom we must give account” (Hebrews 4:13). It’s not just what He sees, but what He knows about us. He knows our heart (Acts 1:24). He knows our secrets (Psalm 44:21). Because God is everywhere (Psalm 139:7-8; Proverbs 15:3), He knows when we fall into temptation and sin (Jeremiah 16:17). He can see even in the darkness (Psalm 139:11-12). No, we’re not getting away with anything! Yet, though God sees us, He is compassionate. He can search our hearts (Psalm 139:23-24), and He will call us to repent ~ to turn back to righteous living and godly choices (Acts 3:19) . He knows that we will eventually reap harm or destruction if we continue in sin (Galatians 6:7). And when temptation comes, we can do those things that lead to victory. 1. “See” Your Temptations for What They Are! Identify whether they are physical, mental, emotional, or spiritual (or a combination of these). Is it something that will contribute to poor health, financial ruin, or guilt? What is your motive? Is it a matter of compromise? Indulgence? Are you toying around with a relationship or a habit that could easily bring you down? Is it lust of the eyes, desires of lust, or something born in pride? (1 John 2:16) Is it something you keep rationalizing or excusing … but you sense or know it is wrong? Is there a clear scripture that reveals God’s will about your temptation? Have you studied the scriptures to determine what God has to say? Is the Spirit of God tugging at your heart whenever you give in? It might not be something that is overtly wrong or sinful, but perhaps God is saying it is wrong for you at this time (or all the time). Find and stand on the truth of the Word of God. Is there a certain place or event that triggers your temptation? Are you bored? (Boredom has sometimes been called the devil’s workshop.) Are you indecisive about what God has called you to do… unmotivated and perhaps lazy? Are you not dealing with stress, frustration or depression ~ and so, in a weakened state? Dig down into your heart… what are your specific triggers? Accept the fact that you’re going to face temptation, and work to manage your life so you can deal with them. You can overcome temptations before they grab your heart. Instead of enabling temptation, guard your heart (Proverbs 4:23) and allow Christ to transform your mind (Romans 12:1-2). Avoid circumstances or people that lead you into temptation, if at all possible. Choose your friends carefully (1 Corinthians 15:33). Don’t buy things you know you shouldn’t have. You might have to take some drastic actions (getting rid of a TV, computer, or other items, perhaps), but do what is necessary to live a clean life. Be sure to “… make no provision for the flesh, to gratify its desires …” (Romans 13:14). Read Romans 6. Practice yielding the members of your body to the Lord as a servant of righteous living. Seek and set your mind on the things of God, and learn how to live “in Christ” (Colossians 3:1-17). Replace wrong thinking (Romans 12:1-2), but also, substitute some new activities (or even healthy distractions) with old unhealthy or sinful habits. Take up a new hobby, get some exercise, join a class … and do it with your whole heart with the desire to please and honor God (Colossians 3:23; 1 Corinthians 10:31). If you struggle, get some practical “skin on” help (Proverbs 17:17; 1 Thessalonians 5:11). Seek out a minister, counselor, Christian teacher or support group that deals with your area of temptation. Be honest with a godly, mature-in-the-faith person about your struggle; and set up some accountability guidelines. Meet or talk on a regular basis. So remember my sneaky Roscoe ~ always giving in to temptation ~ and recognize that you’re not getting away with anything. There’s going to be a pay day of some kind for unhealthy or sinful behavior, even if it is simply lost opportunities or the burden of a guilty conscience. In 1957, the British Broadcasting Company (BBC), produced a program on its prestigious Panorama Programme that informed people that a certain kind of pasta came from bushes. In true reverential, BBC documentary tone, Richard Dimbleby explained how Spaghetti was harvested from bushes, dried, and then processed into strands of spaghetti. I consider myself a fairly wise woman ~ at least, I strive to fear and obey the Lord and His Word (Proverbs 9:10); but on the other hand, I can be sooooo gullible. The longer I travel through this life, the more I recognize when the enemy of my soul is trying to pull the same thing. Where once I could describe my life journey as “Gullible’s Travels,” now I see myself as a Wise Warrior Woman ~ more alert to the devil’s sneaky tactics as I walk hand-in-hand with God, wielding the Sword of the Spirit ~ the Word of God. I had to remind Satan of the truth (and I needed to hear myself proclaim it!) … that God is the source of my strength and any influence I hope to have; and I am going to be obedient to His call, regardless of my imperfect appearance. One of the most powerful exercises we can do as women is to contrast truth and lies. Maybe, like me, you’ve heard something that you think might not be accurate. Ask, “What’s the truth here?” Try to find a scripture passage that shows the difference between truth and lies ~ there are lots of them in the book of Proverbs! Last week, I (Dawn) changed some settings on Facebook that had to do with telephone numbers. While I’m not sure it really was an issue or not, I decided I couldn’t be too careful with all the hackers out there. Settings are a good thing! Hackers are not fun. Hackers are bent on destroying things or people. My enemy, Satan, is like a hacker. I’m his target and he tries to get into my life and destroy everything! This photo symbolizes his evil intent ~ though he doesn’t appear in our lives in horns and tail. He is far more subtle than that. Just as a computer virus enters a computer silently and then does it’s sinister work, Satan is tricky. Sometimes he looks like something we crave. He likes to give us what we want, whether good or bad, if it will draw us away from our Father God. Some of our enemy’s names and descriptions reveal the progression of his sneaky behavior: “Tempter” (Matthew 4:1-3, 10) … “Schemer” (Ephesians 6:11-12) … “Liar/Deceiver” (Revelation 12:8-9) … “Roaring Lion” (1 Peter 5:8-9) … and, at the end, “Accuser of the Brethren” (Revelation 12:10). First he traps and ensnares us (2 Timothy 2:25-26) and then he laughs ~ mocking and accusing us for not staying faithful and obedient to God. But God gives us authority and power (Luke 10:17-20) to fight against this sneaky “Angel of Light” (2 Corinthians 11:14-15). It’s popular in our culture to laugh at the Devil, or even to say he doesn’t exist. But this is one topic that is no laughing matter. Combating Satan is serious stuff, and we can’t do it without the proper weapons ~ the tools for victory. The Holy Spirit works in us, but we also have the power of the scriptures (Jesus’ example – Matthew 4:1-11) and the armor of God (Ephesians 6:11-12). The truth is, the victory is already ours in Christ, if we will claim it and act accordingly (Hebrews 2:14-15; 1 John 3:8-9) ~ if we will submit to God and be on the alert, resisting our enemy (James 4:7; 1 Peter 5:8-9). There is so much more that could be said on this topic; but my point today is simple: Never give Satan a foothold ~ an opportunity to “hack” into your life (Ephesians 4:27a). How? Guard your heart (Proverbs 4:23) against infiltration and attacks from the enemy. Activate God’s protective “Settings” in your life.